When in Sydney, you have to visit Hurricanes and have their ribs. I took my family here whilst we were visiting Sydney. They are very close to their cantonese tastebuds and wouldn’t be content with any other food because it’s their comfort food as they grew up in Asia. But the ribs sauce of Hurricanes got their tick of approval! It’s so hard to satisfy them but I did it (well, Hurricanes did it)! Making the reservation was easy. We arrived and walked straight to our reserved table. We were seated outside on the balcony overlooking the Pyrmont bridge and corner view of the pier. It was a beautiful day for an outdoor dining. We ordered a few small dishes like BBQ wings, salt & pepper calamari and pear and blue cheese rocket salad. Salt & pepper calamari was a small dish, although it looked like there was a lot of seasoning, but the salt pepper taste was very mild. Lightly seasoned, fried and served with dill mayo and fresh lemon. BBQ Wings came with rice like risotto. Although the rice was nice with a bit of BBQ sauce, the dish size was too small for a price of $20. Thankfully the Rocket Pear & Blue Cheese salad was larger in side. Taste was creamy from the cheese dressing but still fresh and tangy with the balsamic glaze. My family found it too strong whereas I found it just right. Blue cheese is definitely not for everyone! For the mains we ordered the 1KG rack of pork ribs, $49.50 and 2 other combos. 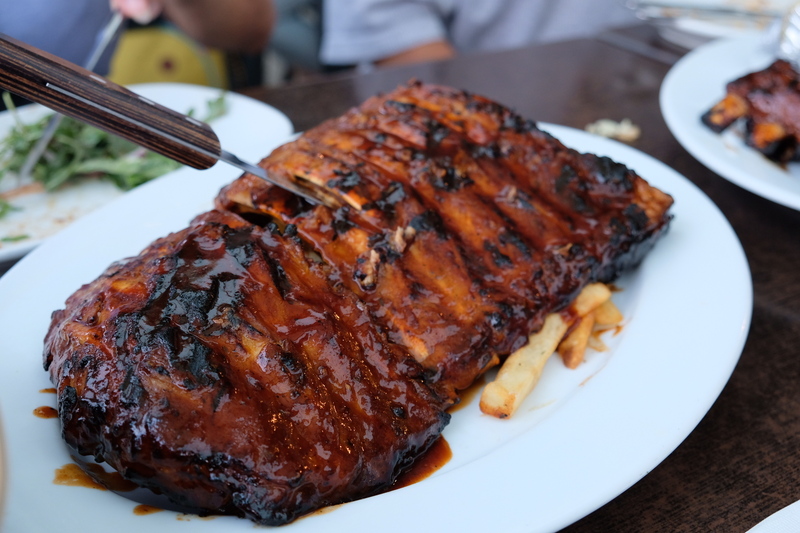 The 1KG rack of pork ribs was so good, as I said the sauce was juicy and the meat was all falling off the rib bone. Combo 1: Steak & Ribs, top 200g sirloin with lamb ribs served with baked potato with sour cream and chives, $55. Steak was very tender and everyone enjoyed a medium rare piece of meat. Lamb ribs did not have the gamey taste, juicy and easy for everyone to nibble. The baked potato was another nice accompany to the combo, buttery and soft. The foil was still wrapped around the potato to keep it warm waiting for us to touch it. It was a decent 15 minutes before I started having the potato and it was still at the perfect temperature to eat. Make sure you eat the baked potato quickly once you’ve unwrapped the foil! Combo 2: Chicken & Ribs, half Portuguese chicken with beef ribs and sweet potato fries, $55 . Beef ribs were much larger and darker. It was delicious. Again seeing the meat fall off the bone and shredding off the meat from the beef rib was very satisfying. In fact, I think the beef soaked up most of the sauce amongst all the ribs – giving it such a juicy flavour. Chicken wasn’t too bad either I think it would be better had it been the leg instead of the breast part of the chicken. The sauce didn’t get through to the middle which made part of the meat dry. Hurricane’s did really well on their ribs. Overall, although it started off alright it ended on a high. It was a meat feast amongst the 6 of us. We definitely over ordered the meat and could have had more salads for a rather “balanced diet”. I used to be given a bib as I ate my ribs, unfortunately we weren’t given any of that this time. I’d recommend everyone to try their ribs if you haven’t visited Hurricanes Grill!